Earthworms are hermaphrodites. When two worms mate, both worms produce children. The worms mate by getting in more or less a 69 position and exchanging sperm with one another. Much later, a cocoon is then secreted by the clitellum band, which is visible near the front of the worm. This is roughly ring shaped. 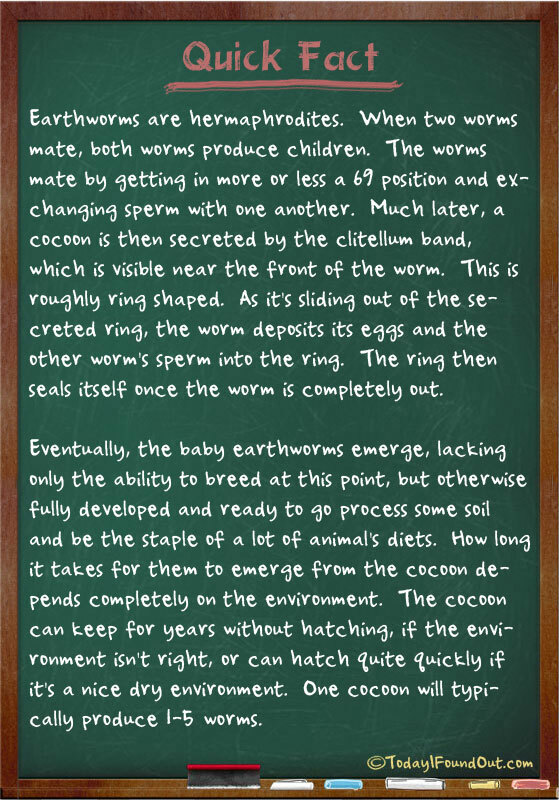 As it’s sliding out of the secreted ring, the worm deposits its eggs and the other worm’s sperm into the ring. The ring then seals itself once the worm is completely out. Eventually, the baby earthworms emerge, lacking only the ability to breed at this point, but otherwise fully developed and ready to go process some soil and be the staple of a lot of animal’s diets. How long it takes for them to emerge from the cocoon depends completely on the environment. The cocoon can keep for years without hatching, if the environment isn’t right, or can hatch quite quickly if it’s a nice dry environment. One cocoon will typically produce 1-5 worms.